Antibiotice has recently obtained the title of international reference standard, for the active ingredient Nystatin granted by the United States Pharmacopeia (USP). I n the summer of 2015, the United States Pharmacopeia – USP (an American body that annually draws a compendium o f quality standards for testing the active ingredients and finished products) requested from Antibiotice a specific quantity of Nystatin API for evaluation. 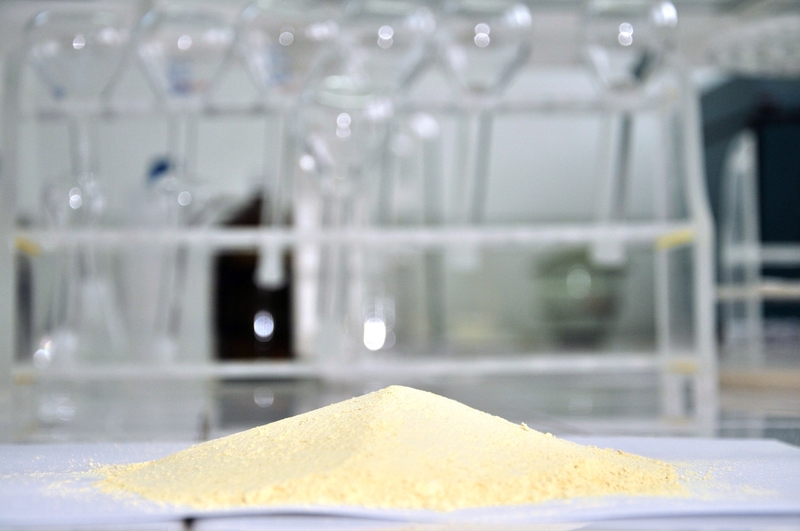 Evaluation of the lot sent was compared to the lot valid at that time, the result certifying that the product Nystatin manufactured by Antibiotice meets the highest quality standards, thus becoming the new world reference standard. „Our forecasts made 10-15 years ago, when we heavily invested in technological upgrading of production, resulted in the achievement of some outstanding results, becoming the world’s leading manufacturer of Nystatin since 2010. 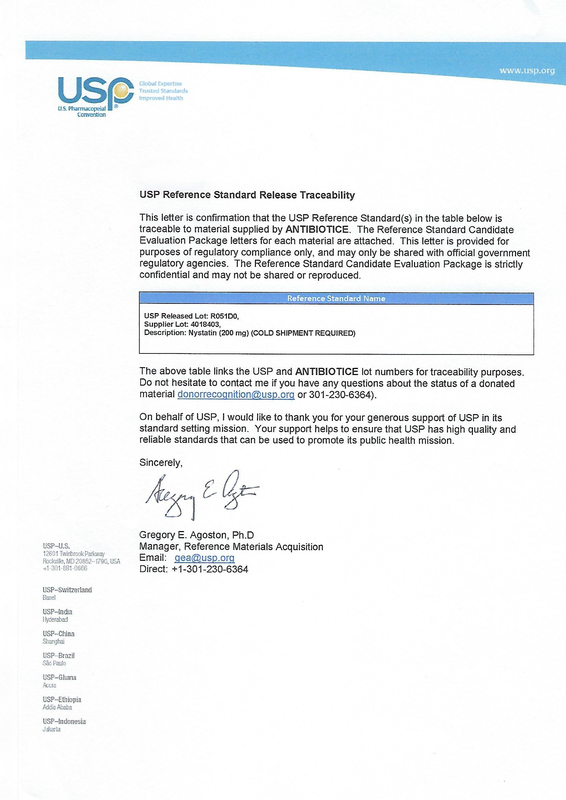 Obtaining the “Cerificate of appreciation” granted by United States Pharmacopeia for Nystatin requires as any manufacturer of Nystatin or finished products containing Nystatin to comply with the quality standard proved by our product. 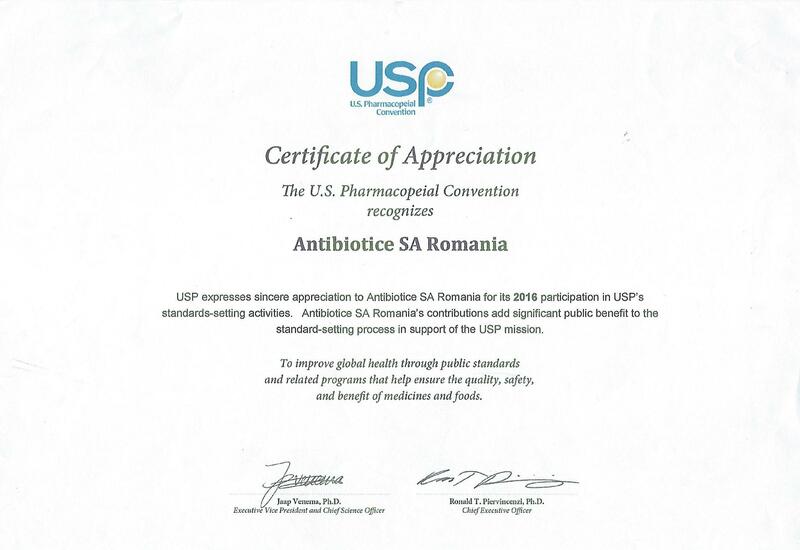 The US Food and Drug Administration congratulated us and thanked us for the care we give to this product” declared Ioan Nani, CEO of Antibiotice. In the first 6 months of this year, export of Nystatin in the US market, the most important market for this product, doubled in value terms compared to the first half of 2016. This was a priority objective for Antibiotice materialized this year in significantly higher deliveries by attracting in our company’s client portfolio some major end-users of Nystatin from this market. The contracts with our US partners are concluded for the long term. ranks fourth among the manufacturers of generic medicines with medical prescription and OTCs.